Using a large star shaped cookie cutter, cut out star shapes. You will need 2 for each filled star. Oil a cookie sheet or use baking paper to keep the stars from sticking to the cookie sheet. Preheat the oven to the temperature indicated on the package (220 C). Place a star on the cookie sheet and using a spoon, place a spoonful of the mushroom pate in the center. 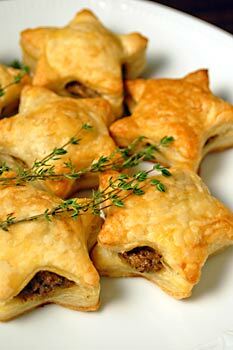 Take a 2nd star, put some water along the inside edges of the star and lay it carefully over the star with the mushroom pate. Gently line up each of the points of the star to match, they will swell and close as they bake. Do this procedure for the rest of the dough. With the left over pieces of dough, you can put them together and roll out the dough again to cut more and thus use all of the dough. Bake the stars for 15-20 minutes or until golden. Note: When we prepared this recipes we made 14 stars from 10 phyllo dough sheets. Melt the margarine, add the herbs and olive oil and sauté the mushrooms. Add the water and allow the mixture to season and cook off a bit. When the liquid is about halved, remove from the heat add the ground almonds and and puree to a fine pate.